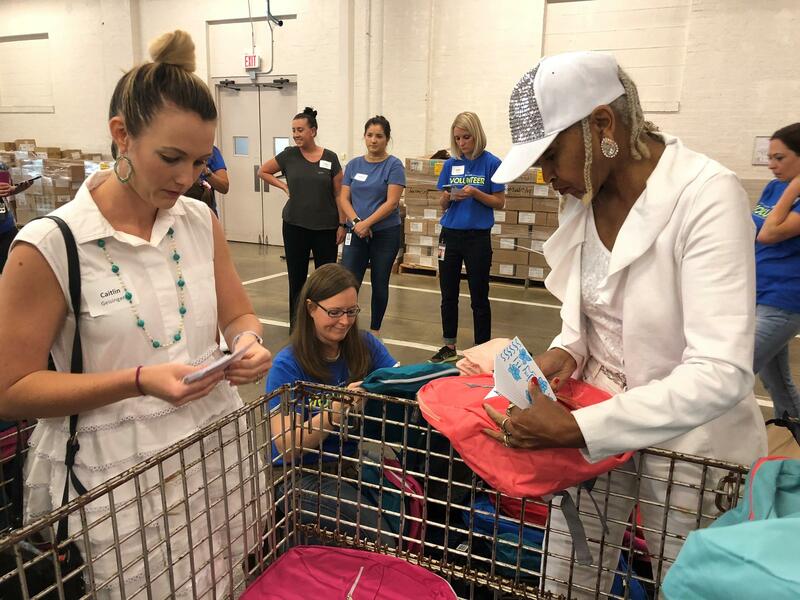 Volunteers stuff backpacks with school supplies ahead of Summerfest, which Kansas City Public Schools holds every year to make sure students are ready to return to class. The wait for immunizations at the Kansas City, Missouri, Health Department most afternoons this summer has been two, sometimes three hours – and it’s likely to get worse as the first day of school nears. The health department and other public health providers will also be immunizing children at Summerfest, the back-to-school bash Kansas City Public Schools is hosting Saturday. Last year, despite torrential rains that drenched the festival grounds, more than 5,000 KCPS families showed up. This year clear skies are in the forecast. All week long volunteers have been stuffing backpacks with school supplies to hand out at Summerfest. “We want to make sure when you show up, you have a backpack and school supplies, you have a uniform T-shirt, and your immunizations are done,” says Nicole Collier-White, director of the KCPS Education Foundation, a nonprofit that partners with the school district to provide support to students. Collier-White says the start of school is an expensive time for families, and the goal of Summerfest is to make sure every child in the district is ready to learn on Aug. 13, the first day of school. “We want to remove that barrier,” Collier-White says. In addition to immunizations, families can get asthma screenings and vision checks, as well as assistance registering for Medicaid if they’re eligible. Summerfest takes place from 10 a.m. to 2 p.m. Saturday, Aug. 4, in the park directly north of the district office at 2901 Troost Ave. Because there’s limited parking, the district has partnered with the Kansas City Area Transportation Authority to provide shuttle service from all KCPS high schools.